After a good sweaty session at the gym, there’s nothing I love more than coming home to a delicious, already made breakfast waiting for me in the fridge. That’s where these easy make ahead bacon egg cups come in! 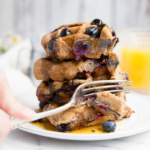 I can’t tell you how many times I’ve eaten one or two of these straight out of the fridge, simply because I was starving and wanted something quick, or because I was in need of a quick grab and go breakfast. I know keto, low carb, and whole30 diets are all the rage these days and these bacon egg cups pretty much check all the boxes. They’re delicious, packed with veggies and easy to make, what more could you want? 1. Add 1 slice of bacon to each muffin cup. Make sure to wrap it in a circle around the muffin tin. Bake for 15 minutes. 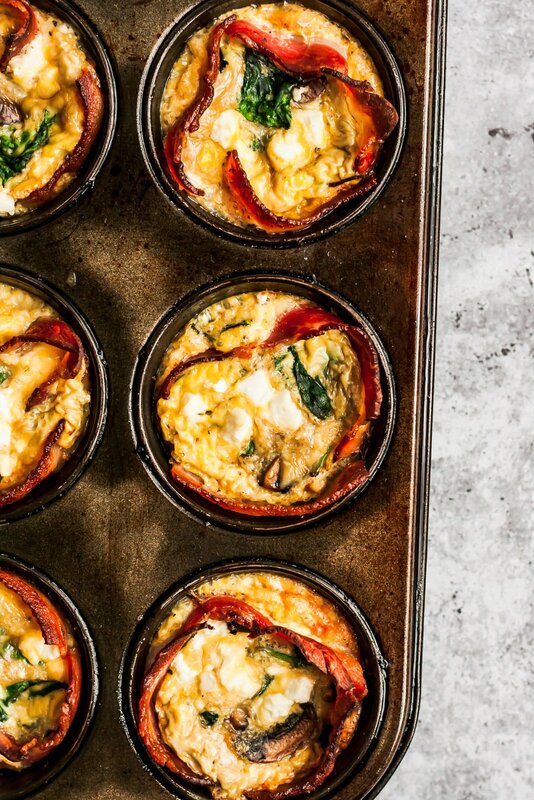 There’s no need to use muffin liners or cooking spray in these bacon egg cups. 2. Saute veggies and spinach. Divide between muffin cups. 3. Whisk eggs, almond milk and salt and pepper together. 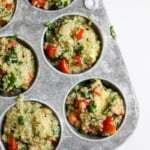 Pour into muffin cups on top of the veggies. Top with feta cheese crumbles. Bake for 15 minutes. Run a knife around the edges of the bacon then remove from muffin tin and enjoy! 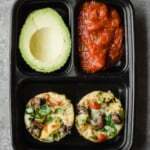 -any cheese or veggies should work well in these egg cups, just make sure they don’t have a ton of moisture otherwise the egg cups might get soggy (example: zucchini or really juicy tomatoes). These bacon egg cups with store well in the fridge for 5 days. Simply allow them to cool completely to room temperature, then transfer to a container. If you want to freeze your egg cups, simply place them in a freezer safe container after they’ve cooled completely. They should stay good frozen for up to 3 months. However, I personally think these are best when stored in the fridge! To reheat bacon egg cups from the refrigerator, place them on a microwave safe place and microwave for 20-30 seconds. If they are frozen, I recommend reheating them for 45-60 seconds. 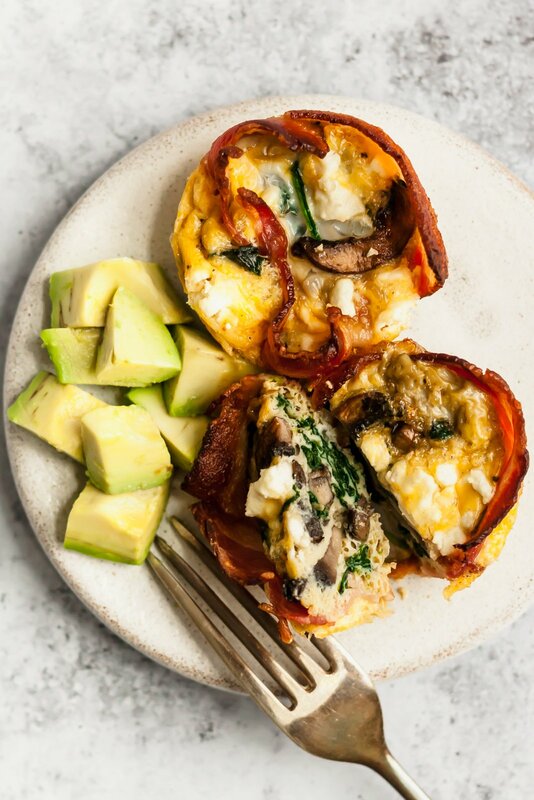 If you’re looking for a low carb or keto option, I suggest serving these bacon egg cups with a side of avocado. You can also serve them for brunch — they’re delicious hot or cold! 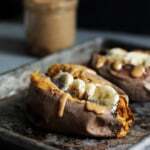 Personally I love them with a side of really good toast slathered in peanut butter for a delicious and easy post-workout breakfast. 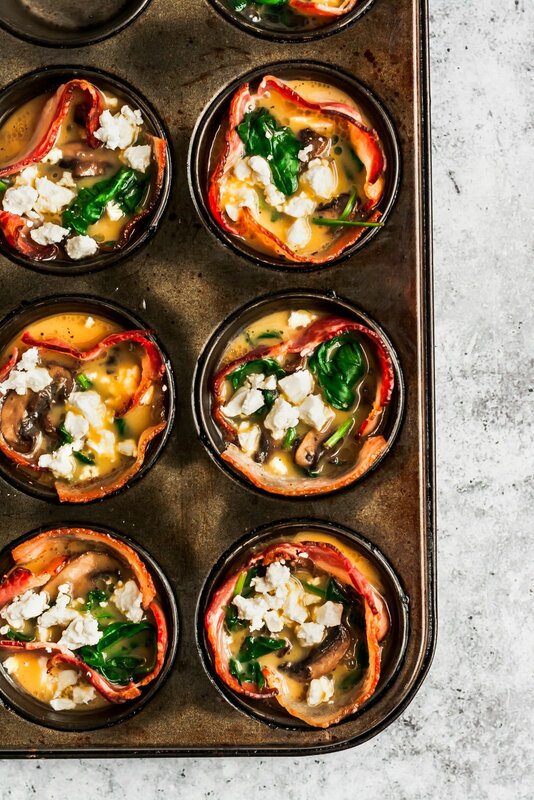 Delicious low carb mushroom spinach bacon egg cups with crumbles of feta in every bite. You'll love this healthy make-ahead breakfast that's packed with protein and takes just 30 minutes to make. Easily made paleo, too! Preheat oven to 400 degrees F. Add bacon slices to muffin pan (we’re only using 10 of the muffin cups) and wrap bacon in a circle around the edges of the tin. The bacon will likely overlap a bit, but that’s okay. Bake for 15 minutes. 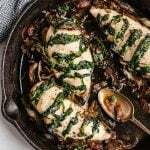 While the bacon is cooking, you can saute your veggies: In a large skillet, add in olive oil, garlic and mushrooms; saute for 5 minutes or until mushrooms cook down and begin to turn a slight golden brown. Once that happens, add in spinach and cook for another 2 minutes or until spinach wilts. Set aside. 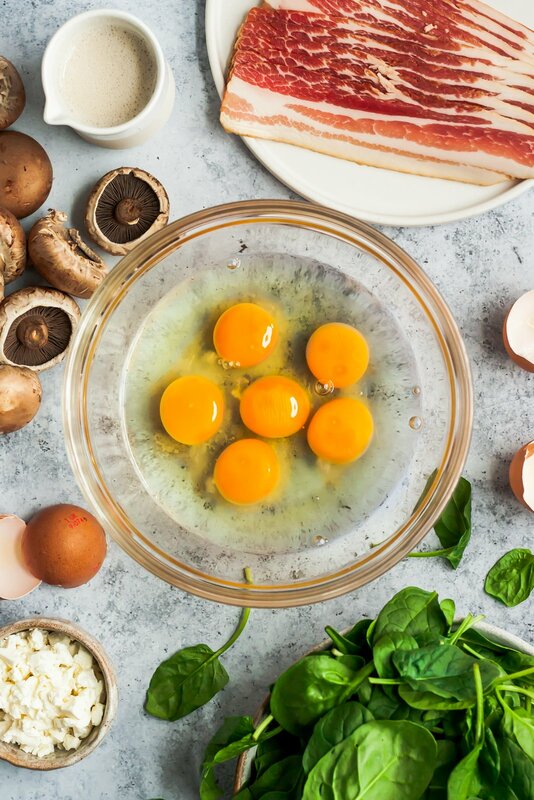 In a large bowl, whisk together eggs and almond milk. Season with salt and pepper. Set aside. When bacon is done cooking, remove from oven and rearrange the slices. You can drain some of the grease if you’d like but it I like to keep it in because it helps the muffins not stick to the pan. Most likely they will have shrunk up during baking; simply pull the slices back with a fork towards the edges so that’s there’s enough room to add in the veggies and egg mixture. 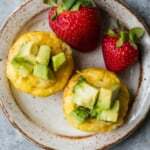 Evenly distribute veggies between each muffin cup, then pour egg mixture in each cup, filling a little more than halfway, or so that there is even distribution. Sprinkle with feta cheese. Bake for 15 minutes. Once done, cool for two minutes, then run the edge of a knife around each egg cup and remove from pan. Serve with a side of avocado slices. Makes 10 egg cups. 1 serving = 2 egg cups. 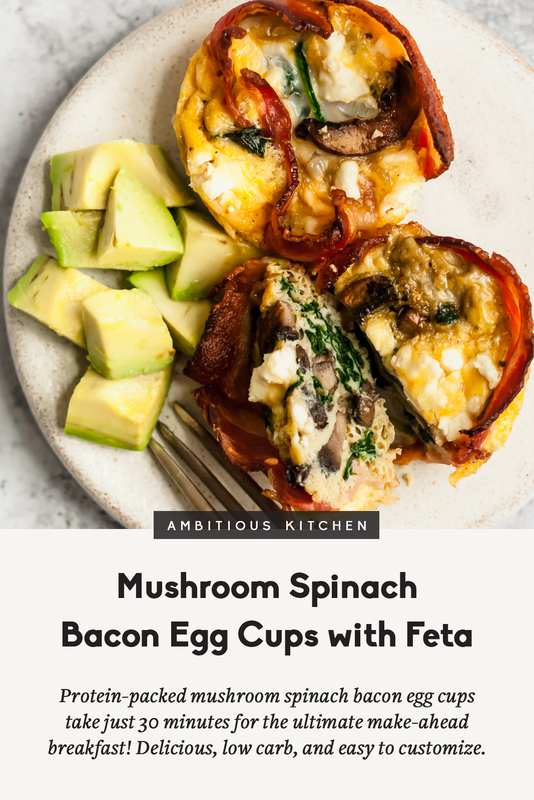 12 Responses to "Mushroom Spinach Bacon Egg Cups (low carb!)" These look so tasty! Can not wait to give them a try. Made these and loved em! So delicious! OMG! Mine came out looking more like Yorkshire Pudding, the eggs puffed up and over took the bacon (the bacon is in the middle. I guess I had too much grease). I’m sure they will be fine, because I love Yorkshire Pudding!! They are resting now, I will drain them on paper towels! We learn by trail and error, however I’m sure this is no error. As they say, It is what it is!! These egg cups are absolutely delicious and pretty enough to serve on special occasions or brunch with friends. I substituted turkey bacon, used 2% milk and a splash of Tabasco sauce in the eggs and they were perfect. This is my new favorite egg cup/breakfast-on-the-go recipe and I will be making them often. 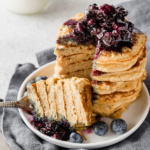 Thank you so much for this yummy recipe. Absolutely! I’m planning on making these for Easter brunch 🙂 Glad you found these Effie! Can you use turkey bacon? I haven’t tried it but some people have used turkey bacon successfully! Note that it might just be harder to shape the bacon around the edges of the muffin tin (and for the bacon to retain this shape).